GO is an aliasing and redirection application. Don’t let the jargon intimidate you, just think of it as a way to make and use shortcuts to College resources. If you’d like to visit a GO shortcut when you’re connected by VPN or on campus, simply type it into your address bar in your web browser. For instance type “go/lisblog” and hit “enter” to get to the LIS blog. If you’d like to see a list of shortcuts that are currently available type “go” and hit “enter” to visit the “Gotionary”. 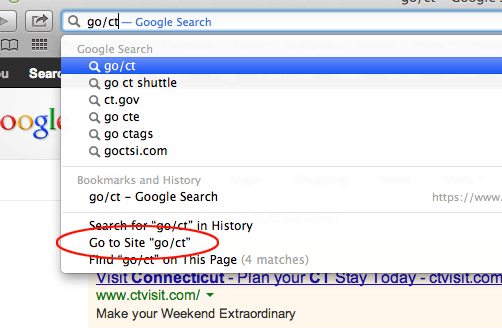 Go is also available as a text box at m.middlebury.edu for mobile devices, or as an optional panel on your portal page. Tip: When off campus add “go.middlebury.edu” to any GO shortcut in lieu of “go”. If you’re using Chrome or Safari you may find a search is triggered instead of a redirect. There are multiple ways to circumvent the integrated search feature when using GO. If you prefer to select from options, look for the “Go to Site” option in the drop-down that appears below the address bar. Type a code in and hit “enter”. A search results page will appear. Below the address bar it should say “Did you mean to go to http://go/…” Click on that to follow the link to the go/shortcut. After that Chrome should automatically resolve any go shortcuts. December 2014 update: As of version 34, Firefox now searches by default similar to Chrome with a preference to not search. See the LIS wiki for instructions. You can use a GO shortcut as a link URL for any page internal to middlebury.edu. Example: <a href='http://go.middlebury.edu/lisblog'>LIS Blog</a>. You’ll want to use a GO shortcut rather than a direct link for any resources you are linking to that could change location. As long as the shortcut admin updates the shortcut when a content location changes you won’t need to update any of your links. Tip: Don’t forget to use the full url “go.middlebury.edu” so that users from off-campus will be able to use the link. GO eased the launch of the new site by allowing links in content to be easily updated en-mass. GO has also become central to our search strategy as GO shortcuts are provided as suggestions and automatic-redirects when you enter search terms on the main site. This entry was posted in LIS Staff Interest, Middlebury Community Interest, Post for MiddNotes on September 24, 2013 by Matthew La France.